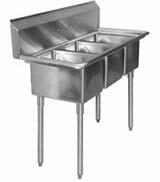 AERO 3 Compartment Stainless Steel Sink. No drainboards. NSF. Overall length 60". Compartment size 18 x 18 x 12-inches. 18 gauge 300 series stainless steel. NSF approved. See diagram below for detailed measurements. Use 8-inch on center Royal faucet with 14-inch spout (available below). Made in the U.S.A.